Cookie & Brownie Box for sale. Buy online at Zingerman's Mail Order. Gourmet Gifts. Food Gifts. 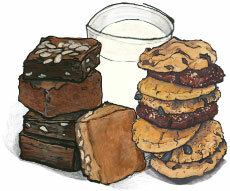 Big bodacious brownies & cookies. Almost a quarter pound each, made with amazing all natural ingredients like full-fat butter, toasted nuts, fresh, local hand-cracked eggs. I could go on, but you just need to have one—you really can taste the difference. The assortment includes our coveted cult classics like the toasted walnut Magic Brownie and No-nut Black Magic, plus loads of others like the Ginger Jump-Up cookie, which folks go absolutely bonkers for. Demand for these amazing brownies is probably half the reason we started shipping food in the first place, over twenty years ago.